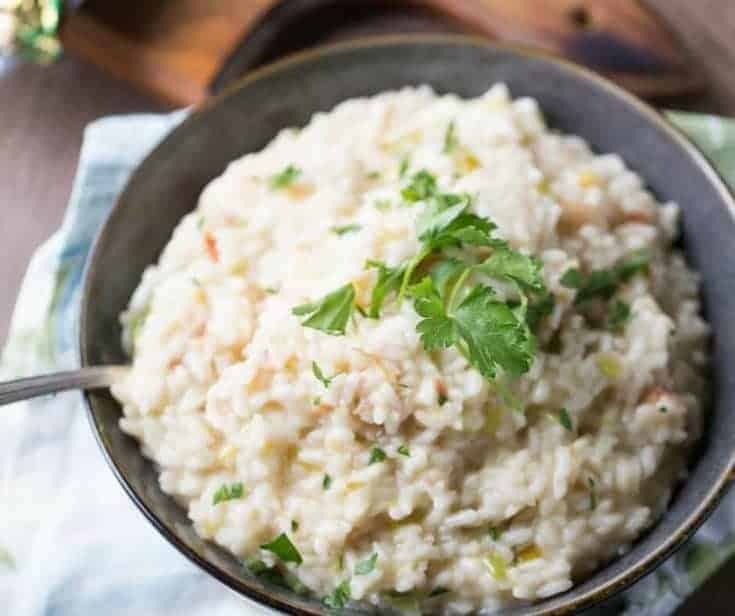 Bacon risotto would be good all on its own, But when you add fresh and lightly sauteed leeks as well as tangy white cheddar cheese, you end up with a side dish that is out of this world! I vividly remember the first Easter I ever hosted. My husband I and had a new house and were eager to fill it with family. We invited my in-laws and my husband’s grandfather down for the big day. I went out and purchased a pristine white tablecloth, colorful cloth napkins, a centerpiece, and candles. I was in the mood to entertain! I also remember making very gray potatoes. I knew in addition to this Dilly Orzo Pasta Salad, one of the side dishes I wanted to serve was a simple potatoes Anna recipe. To streamline my prep process, I peeled and sliced my potatoes hours before I needed them. If you’ve ever done the same, you will know that potatoes will turn gray if cut too soon. And there is no recovering from gray potatoes. By the time I realized my mistake, it was too late. I knew I would just serve my gray potatoes and hope to wow everyone with dessert instead. Needless to say, I never prep my potatoes in advance. 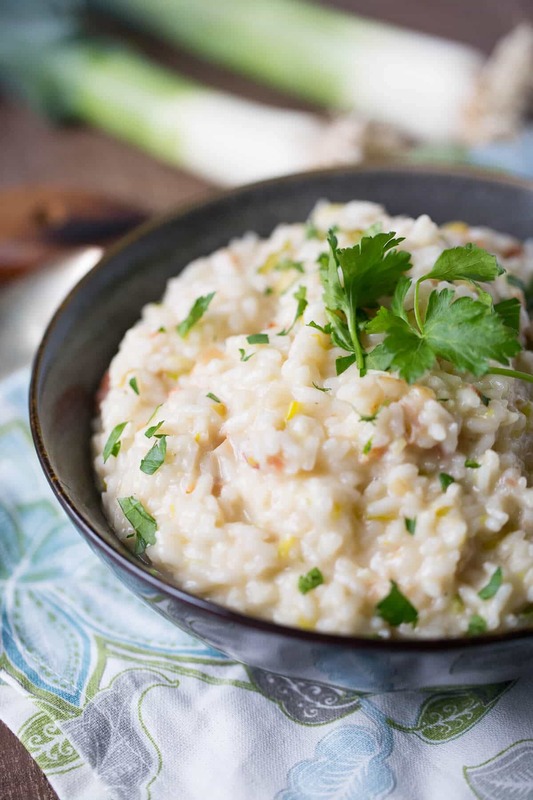 This bacon risotto recipe is a good stand in for any potato recipe you may want to serve. 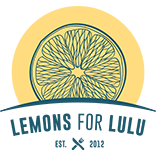 It starts with arborio rice. 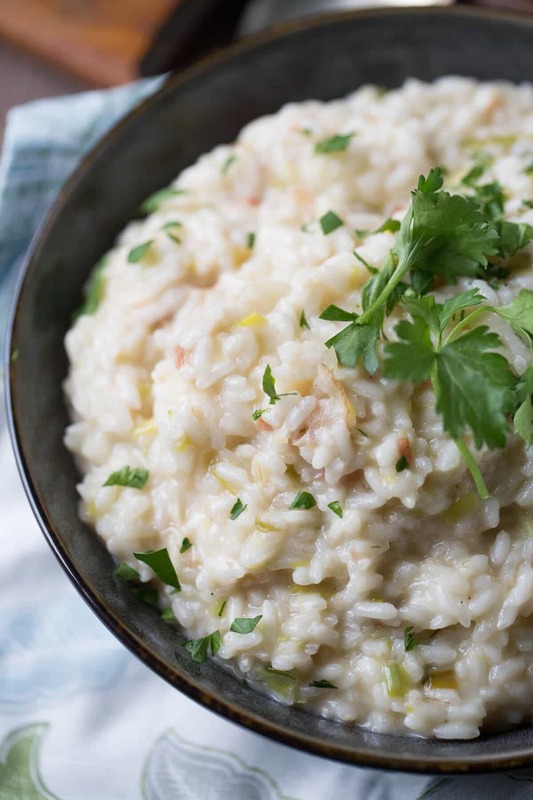 You HAVE to use this rice to get the right consistency and texture for risotto. Despite what you may think risotto is very easy. It just takes time. I cooked my bacon in a saucepan, then wiped out the grease. I then cooked my leek until slightly soft and opaque Leeks are in the onion family, but they are very mild tasting. They add a nice subtle flavor to this dish. Chicken broth is added slowly until the rice softens and thickens. I added a good cheddar cheese to make this risotto ultra rich and creamy. This is a great side dish to have in your back pocket when you want to impress! This bacon risotto is epic! This side dish with it's fresh leeks, salty bacon, and creamy cheddar is an absolute dream! Heat chicken broth in a separate saucepan until warm. Cook bacon in a medium saucepan until crisp. Remove bacon and wipe out grease. Add butter to the saucepan. Add the leeks, cooking until tender and soft. This should take around 5-7 minutes. Add rice to the leeks; stir. With the heat kept on medium low, add one ladle of chicken broth into the rice constantly stirring until the broth is absorbed. Continue this process until the rice is plump, cooked and creamy. Stir in cooked bacon and shredded cheddar cheese. Serve immediately. Leeks are some of my favorite spring produce!! Their flavor is so so lovely. We had a bad leek season in the PNW 2 years ago, and you literally could not find leeks anywhere!! It was such a bummer!! 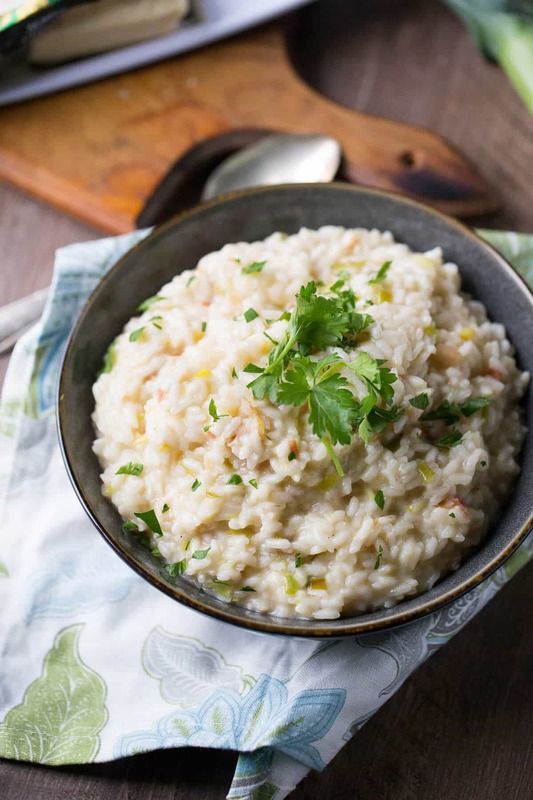 I am so glad you used arborio rice! 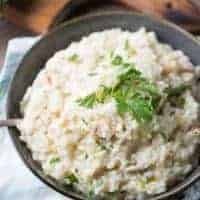 It makes such a huge difference in risotto – I see lots of people using regular rice and I have done it too in a pinch – but its just not the same!